Valentine Weekend in Milan? Head to Verona! 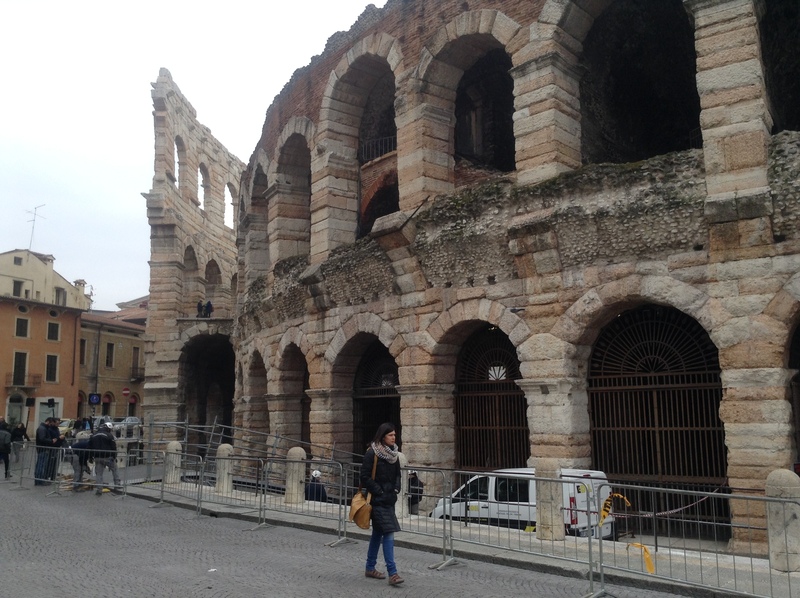 A day trip to Verona on the 14th of February, 2015 will probably remain as one of the best Valentine’s day ever. It was fortunately a Saturday and weekend traveling is the norm in Milan. To celebrate those memorable moments on this auspicious day, I have finally decided to Blog about it. who loves action movies and falls really short in comparison to the other Italian guys around when it comes to “Romance”. But circumstances with some one special can always bring out the best of the old MilanKaRaja. 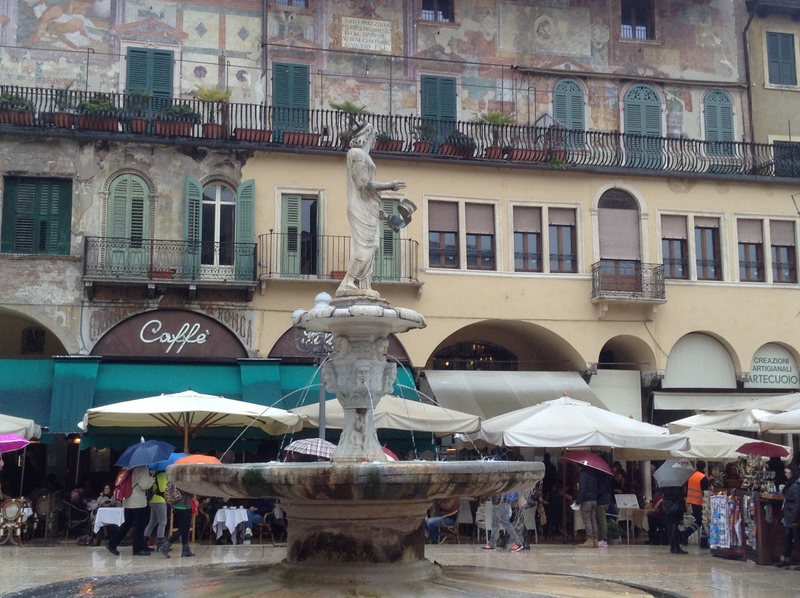 A trip to Verona is awesome even on a Rainy day! Tip: Avoid pointy high heels when traveling in Italy. You walk a lot, quite often on old pebbled pathways near the city centers. Situated near the mighty Garda lake and the Adige river, this ancient city inhabited by the Romans served as the setting for Shakespeare’s famous Romeo & Juliet. You also have an old Roman Arena or Amphitheater much bigger than the one we had in the Student Activity Center at IIT Delhi. Sitting on the top is quite scary actually. One slip and you could find yourself rolling down. 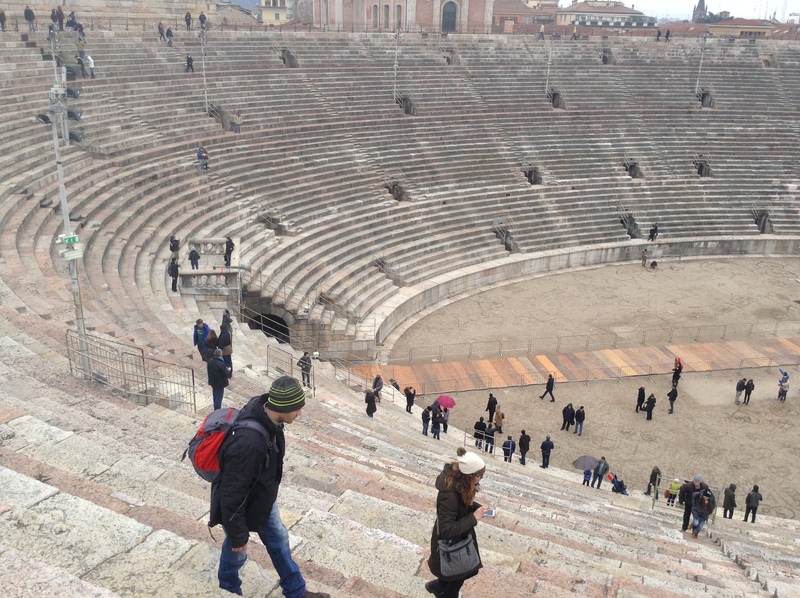 I like the Colosseum in Rome too, but this amphitheater can host gladiators and a huge crowd even today. 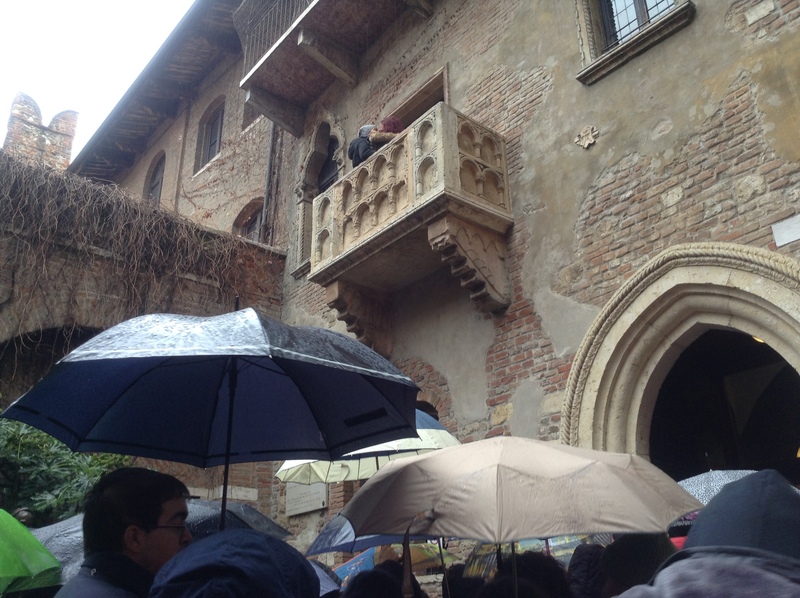 As a setting for Shakespeare’s play, There is a building dating back to the 13th, which features the balcony where Romeo promised eternal love for his beloved Juliet in Shakespeare’s famous Romeo & Juliet. 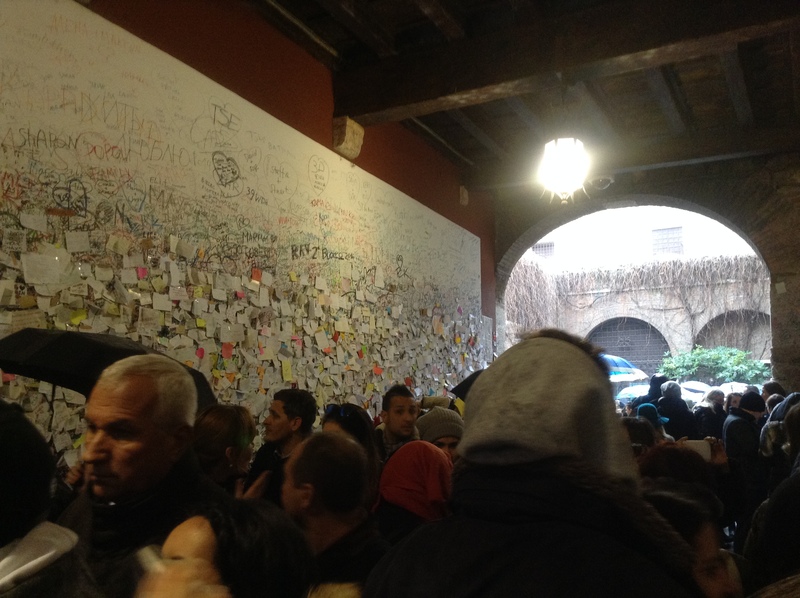 Surprisingly as we approached the Casa di Giulietta, we found ourselves surrounded by hoards of young crowd including many women from far away seeking blessings for true love. There was a very Twilight millennial commercial feel to it at first, but as the day went by and I spent more time at Verona, I too was going to be consumed in its magic. There really is much more to the place. As we walked past the crowd, I was reminded of my temple visits in India. 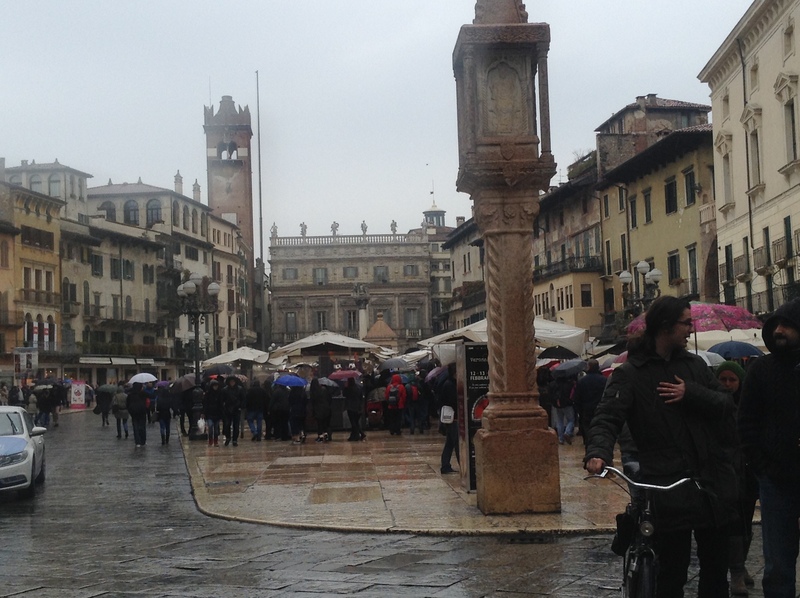 Love seemed to be the only religion in Verona on that Valentine’s day. I was sure I would have a great time at Verona, as living in Italy for over 6 years, I have always enjoyed my travels within Italy amidst any weather discovering something unique from each city every time. 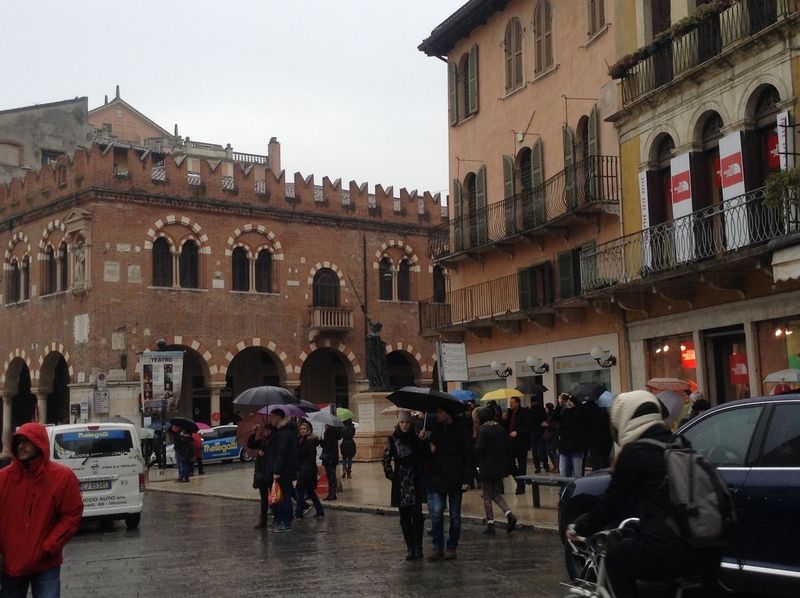 At Verona on a rainy Valentine’s day, the idea of watching theater in the evening was a very tempting idea. Though it was in Italian, as a foreign professional seeking to improve my primary language at work, I was super excited to do a very Italian fun activity. Back then, I commuted everyday from Milan to Turin for work. Seeking to escape from a very tiring work schedule, the thought of sitting down to do a lazy activity after strolling across Verona was quite misleading. I was not sure of what to expect as I really had not seen much live theater since IIT Delhi. To see professionals perform in Italian was quite an interesting experience. The play that was mainly focused on 3 great actors. The brilliant young Romeo & Juliet really gave it their best convincing the audience with a lot of passionate acting. And then there was the master narrator who could easily play the lead in an Italian version of “A series of unfortunate events”. The play that focused on brilliant acting was soon going to receive a taste of Music Manoranjan (Slang for parody or spoofs that has historically been part of IIT culture) from IIT Delhi. Verona was going to see a Bollywood Dad of our protagonist Romeo, pick a fight with the newly appointed Brazilian Dad of our pretty Juliet. Yes, theater gets interactive with audience participation! Not finding much time to shave with my busy weekly schedule, I was chosen to play Romeo’s Dad in the second part of the play, for which I participated with a rather extra enthusiasm trying my best to enchant the family crowd. I knew I could not pull out passionate acting in Italian, so I took to comedy dueling with Juliet’s Dad across the stage with such delight that was shared by many more than than just the kids in the audience. The actors come back and we drown ourself in the seriousness of the play again. Like how in perfume shops, you may need to refresh your sense of smell with some coffee beans, Verona’s theater got some enthusiastic audience participation that really created a great vibe on that day. I was called on to the stage and got to shake hands with the stars while receiving a standing ovation from that great crowd that was gathered that day. 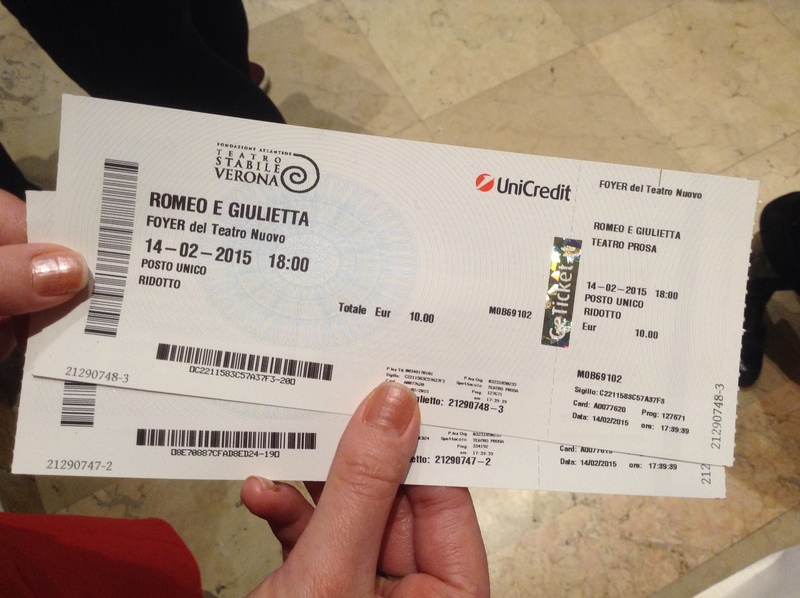 Its not every day that its Valentine’s day and you go to see Romeo & Juliet in Verona with your girlfriend, and you end up getting a standing ovation from the crowd. 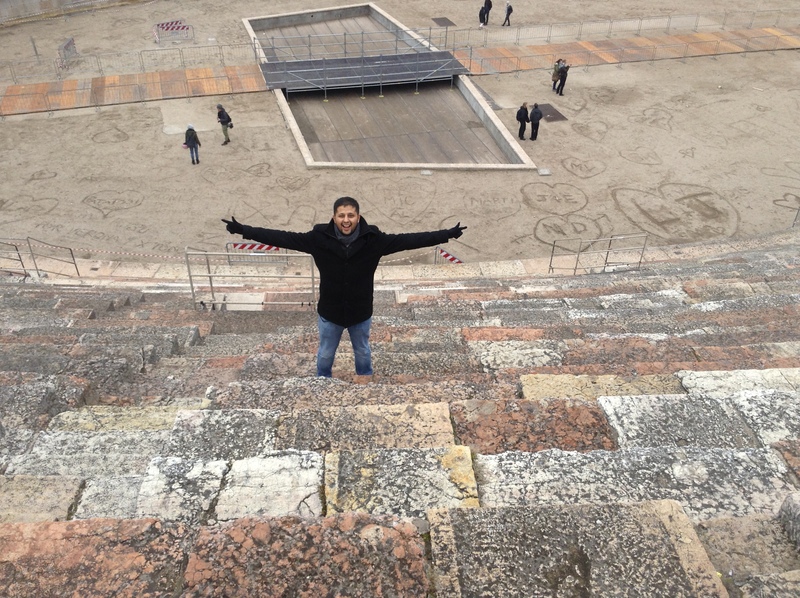 The special day factor was high that day in Verona. I think the important thing to remember that day was that I was really enjoying myself. That really helps you to overcome any other fears like acting, public speaking or even talking with someone you like. A few months later, I had returned to Verona again on a sunny day driving from Milan to get great lunch and then head out to a unique natural thermal spa located in the midst of nature in a park near Lago di Garda. So much for la dolce vita in Italia, meanwhile many Indians fail to see the huge business opportunity in western culture. Instead, hypocrisy is at it’s peak. I read about some organizations that crusade against Valentine’s day categorizing it as foreign influence meddling in Indian culture. God knows, what vested interest they have in their minds. But they surely hate taking advantage of western created events to market tourism. Mean while in Italy, Groupon sales for fun touristic activities targeting couples are always in demand. In India the trend is still to travel in big groups to keep things safer. A huge market is untapped. I think individuals would spend more in smaller groups per person. Any interference in such a trend by morality bickering organizations should be see as anti-growth and consequently anti – national. How India can become a better place with happy tourists? Recently, a new flatmate moved in to our famous Blogging apartment in Via Marochetti, Milan. We have two Bloggers presently. But many of the previous residents who now live all across the world were also in to Blogging. Hosting over 5 people a time, we see a lot of change with people staying for a bit and leaving. Fortunately, our new flatmate is not a lazy blogger like myself. A professional Barber comes with certain cleanliness standards. Hence, our Kitchen looks so much bigger now with all the space. Firstly, Deepak from FastJugaad, who did Economics and Management in Innovation Technology from Bocconi. He not only explained affiliate marketing to me but also told me that building a website was simple. Within no time, I found about SiteGround and how easy it is for me to build any website. A Blog, a Forum or an Ecommerce site, all easy. Just click on the link below to start Blogging and earning today. Finally, Ziyad for creativity and his political Blogging. Thanks to my Pakistani friend to introduce me to this apartment that I call home for the past 3 years. Learned a lot from him about life in the hood in Milan. When Ziyad left, I had a Sales Job with Western Union dealing amazingly well with the Punjabi clientèle. Very often the best of inspiration can come from the least expected place. Your own apartment. That is why it is a good habit to invite guests and be friendly. Everyone teaches you something. If you keep people away, you miss out on enjoying something new. Verona on that day was glad they got to see some Bollywood acting. One new flower in the garden always makes it prettier. Finally, one more thing, I also met my Valentine companion at Via Marochetti.